Bulrush (Typha) – Perennial plants which grow in or near static or flowing water and on marshy ground. Once established in shallow water, they trap silt around the roots, impeding or diverting water flow, and allowing further spread of the plants into water previously too deep to sustain them. For Typha/Bulrush control or complete Bulrush removal we use our Truxor aquatic weed cutter with its clamshell bucket to pull the bulrush out by its roots. Once the plant has been dug out it is left to float and the collection rake attachment is used to lift all the vegetation out of the water. Seeds from the bulrush removal process will still be present in the silt so future growth will still occur, but by removing the whole plant, re-growth can be more easily controlled. Phragmites – Often known as the Common or Norfolk Reed, is an extremely invasive species. If not controlled, the extensive root system will spread to take over the water body it is growing in removing all the moisture, reverting the area back to land. 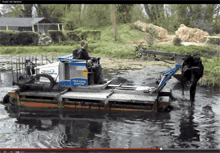 Aquatic Solution’s preferred method of control for Phragmites is to use the excavator attachment on the Truxor amphibious machine to grub out the rhizome root system. This severely weakens the plant making any volunteer regrowth easier to control. Other methods of control leave the rhizome system in place, but the advantage of removal is that it helps limit further regrowth. Once the root mass has been removed, cheaper methods of control, such as cutting or herbicide application, will be more effective. Mechanical Cutting Reed Control – Approved herbicidal treatments can be used for Phragmites Control/Common Reed Control and the chemical can be applied from the bank or a boat. Once the plant has died off, we remove dead vegetation using our heavy duty cutters on the Truxor and then remove it to the bank with the collection rake. Mechanical Reed Cutting and Herbicidal treatments can provide a short term management solution. The Truxor is an ideal machine for bulrush control, bulrush removal and management of the reed bed as it works in the water and as a result no damage occurs to the bank or surrounding areas. Note: Only approved chemicals can be used to treat vegetation in and around water. Aquatic Solutions UK can apply for the required permit from the Environment Agency on your behalf and then apply the approved chemical using our NPTC qualified operators once it has been granted. If you would like to learn more about how we might be able to help you with Bulrush control, Bulrush removal or Reed control, please contact us and we can have an informal chat to discuss the areas that interest you. We will have a conversation with you so we can learn more about your needs. We utilise Google Earth or you can attach pictures (below) of the area to help discuss any project with us in more clarity and detail.